On July 1, 2005, Romania introduces its new redenominated currency, the new leu (code: RON), which is valued at 10,000 old lei (code: ROL). The process, which is known as redenomination, started in March 2005 when Romania started dual-currency display and all prices had to be displayed in both the old leu and the new leu. 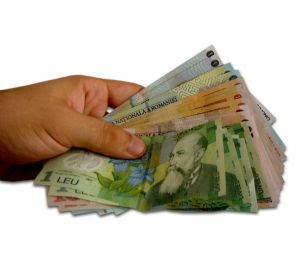 Starting from today, the first notes and coins of the new leu will become legal tender, and the new leu will become the official currency of Romania. The redenomination (or conversion from the old to the new leu) is simple — 10,000 old lei are replaced by 1 new leu. One US dollar will buy 2.98 new lei, while one euro will buy 3.6 new lei. After the similar redenomination by Turkey the old leu had been the world's least valued currency unit, with the US dollar buying 29,891 lei and the euro buying 36,050 lei (on 30 June 2005). With the introduction of the new leu, Romania's currency will be among the most highly-valued in the region. The new leu notes and coins, introduced into circulation today, will circulate alongside the old lei until 31 December 2006, when the dual-currency period ends and all of the old lei are expected to be withdrawn. However, old lei can be exchanged at banks indefinitely. The new notes come into denominations of 1, 5, 10, 50, 100 and 500 new lei. The largest note of the old leu was 1,000,000 lei, or 100 new lei. The largest note of the new leu is worth 500 new lei, or approximately US$167 and €139. New leu notes will also have the same dimensions as euro notes of similar value. Additionally, they will use the same colours and design as their corresponding old leu equivalent (for example, the 100 lei note will look similar to the 1,000,000 old lei note). All notes will be printed on polymer materials. Romania was the first country in Europe to introduce polymer notes, in 1999.